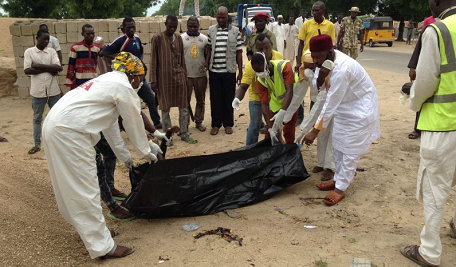 The Police Command in Borno has said 16 persons were killed and 18 others sustained injuries in multiple suicide bomb attacks on Sunday at Muna area of Maiduguri. The Police Commissioner, Damian Chukwu, confirmed the incident in a text message sent to journalists in Maiduguri. Mr. Chukwu said the incident occurred when a male suicide bomber detonated an explosive device in a crowded area, killing 13 people and wounding five others. He said two other female suicide bombers also detonated Improvised Explosive Devices (IEDs) strapped to their bodies and injured 13 persons. “On 22/10/2017 at about 20: 20 hours a male suicide bomber detonated IED strapped to his body at Muna Garage, killing himself and thirteen persons, while five others sustained injuries. “In another development at Muna Dalti, two female suicide bombers detonated IEDs killing themselves and injuring 13 others. “The Injured persons were referred to the University of Maiduguri Teaching Hospital (UMTH) for treatment and corpses were evacuated. “Police EOD teams have been deployed to sanitise the scene. “In all, 16 persons were killed and 18 others injured in the three explosions,” the commissioner said.